Sexuality | Brian Jane's Blog. a laugh, or like running with the wind for awhile. To roll my eyes at human contact, like other adults. Through the underbrush. It was sinister, I swear. Said adults, eternally fearful of a kinder-rupture. At school, you’d lose a week of Physical Education. Basketball Court. Boils stick on balls, you see. Down there, and it shriveled away. Have mercy, Lord! Clothes into a scalding laundry. A fat lot of good. Misery is an itchy, lotion-pink ten-year-old boy. To everybody else. Adolescence: try not to catch it. This is going to be controversial. Just fair warning. A week ago Sunday, our church had its annual picnic at Mason Lake. Very unusually, it was hot, close to 90 degrees after servcies and the sun reached its zenith. We trooped out, enjoyed the sunshine, ate our fill and fellowshiped. 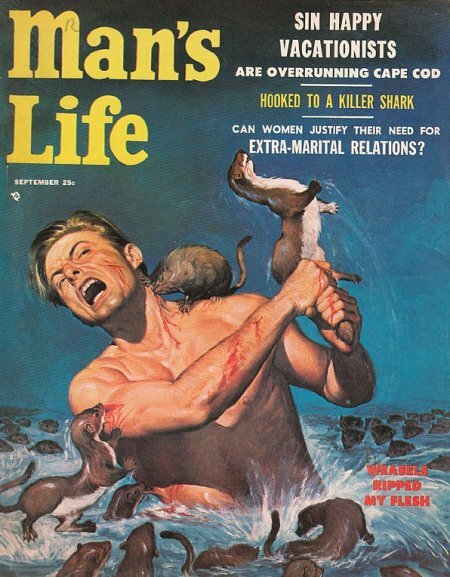 "Weasels Ripped my Flesh", as depicted by Man's Life in 1956. For decades, I’ve known about the Frank Zappa album Weasels Ripped My Flesh. I’ve never listened to any of its tracks, but weasel, being the most hilarious of the mink family, and the flesh-ripping–well, let’s just say that the title itself caught my attention. What I didn’t know until recently was how Zappa came by the title: apparently a friend and devotee discovered the magazine cover to the left, and gave it to Mr. Zappa. He passed the magazine off to a cover artist called Neon Park, and said “Think you can do better?” The famous (and controversial) album cover is below as well. A handful of people in my life know this story. As part of my quest to write honesty into every word I publish, and more particularly to give my readers the kind of openness they deserve in a writer, I’ll put this fact in as broad a forum as I’m able: as a preschooler, I was sexually assaulted. **WARNING** The speculations I considered while writing this post might be offensive for some Christian readers.